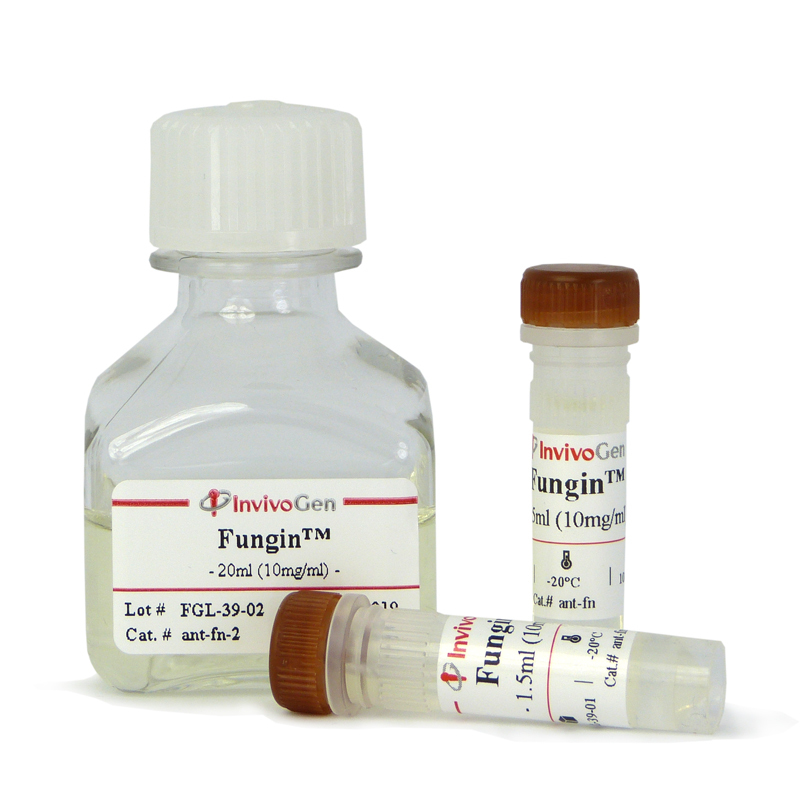 Fungin™ is used as a "routine addition" to eukaryotic cell culture media to prevent fungal contaminations. It can also be used to eliminate fungal contaminations. This antimycotic compound kills yeasts, molds and fungi by disrupting ionic exchange through the cell membrane. Fungin™ is an excellent alternative to Amphotericin B, a polyene antifungal antibiotic. Unlike Amphotericin B, Fungin™ is a highly stable compound. Fungin™ is cell culture tested, and may be added to media containing commonly used antibacterial agents. Active concentration: from 10 μg/ml to 50 μg/ml. Highly stable and water soluble compound. No toxicity on treated cells and no deleterious effects on cell metabolism. Fungin™ is provided as a cell culture tested, sterile filtered light yellow solution at a concentration of 10 mg/ml. Upon receipt it should be stored at 4°C or -20°C. Fungin™ is used as a "routine addition" to eukaryotic cell culture media to prevent fungal (including yeast) contaminations in small or large-scale mammalian cell cultures. Fungin™ can also be used to eliminate fungal (including yeast) contaminations in eukaryotic cell cultures. It is effective against commonly found cell culture contaminants, such as Candida albicans and Aspergillus. Fungin™ is an excellent alternative to Amphotericin B, a polyene antifungal antibiotic. Unlike Amphotericin B, Fungin™ is a highly stable compound and it does not need to be dissolved in toxic deoxycholate. Fungin™ provides maximum protection against fungal contamination with minimum cytotoxicity. Fungin™ is cell culture tested, and may be added to media containing commonly used antibacterial agents, such as penicillin and streptomycin (Pen-Strep). Its use has been cited in many publications. Colonoscopy-based colorectal cancer modeling in mice with CRISPR-Cas9 genome editing and organoid transplantation. Astrocytes expressing ALS-linked mutant FUS induce motor neuron death through release of tumor necrosis factor-alpha. 2017 Tissue Eng Part A. 23(19-20):1142-1151. The Effects of Scaffold Remnants in Decellularized Tissue Engineered Cardiovascular Constructs on the Recruitment of Blood Cells. 2017 Front Vet Sci. 4:132. Immortalization and Characterization of Porcine Macrophages That Had Been Transduced with Lentiviral Vectors Encoding the SV40 Large T Antigen and Porcine Telomerase Reverse Transcriptase. Kriek JM, Jaumdally SZ, Masson L, Little F, Mbulawa Z, Gumbi PP, Barnabas SL, Moodley J, Denny L, Coetzee D, Williamson AL, Passmore JA. 2016 Ann Biomed Eng. 44(4):1061-71. 2014 J Biol Chem. 289(31):21694-705. The prolyl peptidases PRCP/PREP regulate IRS-1 stability critical for rapamycin-induced feedback activation of PI3K and AKT. Duan L, Ying G, Danzer B, Perez RE, Shariat-Madar Z, Levenson VV, Maki CG. 2014 Breast Cancer Res. 16(4):R78. MicroRNA-18a inhibits hypoxia-inducible factor 1α activity and lung metastasis in basal breast cancers. Krutilina R, Sun W, Sethuraman A, Brown M, Seagroves TN, Pfeffer LM, Ignatova T, Fan M.
ABCB6 is dispensable for erythropoiesis and specifies the new blood group system Langereis. Hepcidin regulation by innate immune and infectious stimuli.